LAND ROVER RANGE ROVER L322 3.0TD6/4.4 V8 2002 TO 2007 UPTO VIN 7A249757. REAR SHOCK ABSORBER PAIR. PARTS COLOUR MAY VERY DUE TO MANUFACTURE PRODUCTION. PART NUMBERS ARE FOR REFERENCE ONLY AND DO NOT IMPLY THE MANUFACTURER. Terrafirma steering damper. Wheel Nuts Hi lift jacks & Acc. Tyres Safari Snorkes Defender Parts Discovery Parts Range Rover Parts Wheels Tools Gift Ideas Series Discovery 1 89-93 Discovery 1 94-98 Discovery 2 99-04 Range Rover Classic Range Rover P38 Range Rover l322 Freelander Discovery 3 Defender 90 & 110. 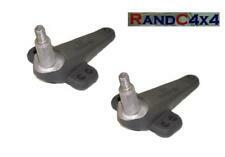 These are suitable for all Range Rover P38 models. TF126 Rear Shock Absorber Lengths TF125 Front Shock Absorber Lengths Add to Favourites. Closed: 305mm. Open: 485mm. Land Rover Series, Discovery 1, Range Rover Classic. Steering Damper. Land Rover Discovery 1. Land Rover Series 3. Range Rover Classic. In many cases your problem is easily resolved by a phone call. Código interno para información: 236552. Nós podemos verificar isso. Wir können es überprüfen. Código interno: 613373. Amortiguador trasero derecho LAND ROVER RANGE ROVER, Año: 1988. Wir können es überprüfen. Nous pouvons le vérifier. MONROE ORGINAL 16428. NEW RH FRONT SHOCK ABSORBER TO FIT THE FOLLOWING>. ROVER 75 ALL MODELS 1999 to 2005. THIS IS A QUALITY MONROE PART AND NOT A CHEAP IMPORT. THE COMPATIBILITY IS NOT ALWAYS 100% CORRECT. 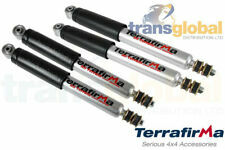 Terrafirma TF126 Shock Absorbers. 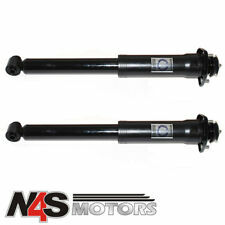 2 x Heavy Duty Rear Shock Absorbers TF126. Terrafirma Rear Heavy Duty Shock Absorbers (Pair). 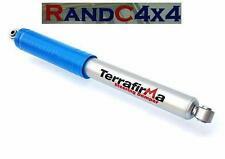 Manufacturer: Terrafirma 4x4. Range Rover P38 Models(1995-2002). Series 2 & 3 - Defender 90/110/130, Discovery 1,2,3,4,5 & Sport - Freelander 1 & 2 - Range Rover Classic, P38, L322, L405, Sport & Evoque. LOWER SHOCK ABSORBER WASHERS & LOCK PINS. LAND ROVER SERIES 1,2,3. SUITABLE FOR ALL LAND ROVER SERIES MODELS. ATTACHED TO THE SUPPORTING LEAF SPRING PLATE. WITH LEAF SPRINGS FITTED. THESE ARE FOR THE LOWER SHOCK MOUNTING. Aquí tenemos nuevos 36IV carburadores de tipo Zenith para la serie. Reference OE/OEM Number erc2886. Manufacturer Part Number ERC2886. Rover 75 2.0 Diesel Trasero Amortiguadores Par de raíces. Rover 75 (Rj) 2.5 V6 (129 kW). Bilstein B4 Shock Absorbers - the original mono-tube gas pressurised shock absorbers. The benefits of Bilstein B4 at a glance Suits Models with a Power Level of 129 kW. Amortiguador delantero izquierdo LAND ROVER freelander 2.0 turbodiesel, Año: 1999, Observaciones: con muelle. Llámanos y pide tu pieza. Te ayudamos a encontrar lo que necesitas. Atendemos por whatsapp. Common with all Terrafirma shocks, Pro Sports are built with the largest possible fully welded mounting pins and eyes with rubber bushes for maximum strength and durability. A new set of front and rear 2" Terrafirma pro sport shock absorbers. Part Number: DC5003. Land Rover Discovery 1 Rear Shock Absorber. Suitable for all Discovery 1 models 1989-1998. Pictures are for reference only and specifications may alter without notice. Product specifications are given but it is up to the end user to ensure that the product is fit for that purpose. Amortiguador trasero derecho LAND ROVER FREELANDER 2.2 TD4, Año: 2010. Referencia : LR008234. Nós podemos verificar isso. Wir können es überprüfen. Amortiguador delantero izquierdo LAND rover evoque dynamic, Año: 2013 BJ3218K001AD. Código interno para información: 657640. Especialistas en BMW. Envíos a toda España. Consultar precio. CAT autorizado. Genuine MG Rover 75 LH Front Shock Absorber RND105370 NEW Delphi BWI. It represents the standard we aspire to achieve on goods marked as such. With a plethora of parts available on the shelf, we should have the part you require. Código interno para información: 119617. Nós podemos verificar isso. Wir können es überprüfen. LAND ROVER FREELANDER (LN) 1.8 i 16V 4x4 1998/02 - 2000/11 88 120. LAND ROVER FREELANDER (LN) 2.0 DI 4x4 1998/02 - 2000/11 72 98. LAND ROVER FREELANDER Soft Top 1.8 i 16V 4x4 1998/02 - 2006/10 88 120. AMORTIGUADOR TRASERO IZQUIERDO LAND ROVER DISCOVERY V6 TD S, Año: 2007, RPD000309, NEUMATICO. Observaciones: NEUMATICO. Nós podemos verificar isso. Wir können es überprüfen. Amortiguador trasero derecho LAND ROVER discovery 4 tdv6 hse, Año: 2013 AR01753782 NEUMATICO. Referencia : 3496895. Código interno para información: 652811. Todas y cada una de nuestras piezas están etiquetadas e inventariadas hasta el más mínimo detalle. A Pair of 5" Lenth Procomp gas filled shocks. Defender >to date. These uprated shocks are uprated Nitrogen gas filled shocks. Range Rover classic. expanded twin tube design increases fluid capacity upto 50%. Amortiguador de direccion LAND ROVER DISCOVERY TD5 E, Año: 2002. Referencia : QHH100001. Código interno: 917040. No se realizan envíos internacionales en territorio insular. Nous pouvons le vérifier. Código interno: 933677. Amortiguador trasero derecho LAND ROVER EVOQUE SE Dynamic, Año: 2015 LR0770942. Referencia : BJ3218080AE. Nós podemos verificar isso. No se realizan envíos internacionales en territorio insular. Código interno: 300311. Amortiguador trasero derecho MG ROVER MG ZS 2.0 TD, Año: 2004. Wir können es überprüfen. Nous pouvons le vérifier. Código interno: 923238. Amortiguador delantero izquierdo LAND ROVER RANGE ROVER SPORT V8 TD HSE, Año: 2009 22274809. Referencia : RNB501610. Wir können es überprüfen. Nous pouvons le vérifier. Land Rover Discovery 1 Rear Shock Absorber Upto 94. Amortiguador delantero derecho LAND ROVER RANGE ROVER evoque 2011 Não definido LV 76/15, 127061 . Referencia : 224DT / 224DT, Motor: 2.2 D 224DT, 5 puertas Código interno: 124567. Nós podemos verificar isso. Código interno: 1916004. Amortiguador delantero derecho MG ROVER SERIE 75 TOURER 2.0 CDTi Classic, Año: 2003. Referencia : RND111901. 57087 MANGUETA DEL. Rover Serie 75 (RJ) 2.0 CDT Classic [2,0 Ltr. - 85 kW 16V CDT] 2.0 CDT Classic [2,0 Ltr. La herramienta gratuita para publicar anuncios. ]. Código interno: 613374. Amortiguador trasero izquierdo LAND ROVER RANGE ROVER, Año: 1988. Wir können es überprüfen. Nous pouvons le vérifier. LAND ROVER SERIES 2, 2A, 3. CHASSIS SHOCK ABSORBER BOLT KIT. CHASSIS BOLTS X 2. FLAT PLAIN WASHER X 2. REAR SHOCK ABSORBER BRACKET Fits: • Defender 1984 on • Discovery 1 1989-1998 • Range Rover Classic 1986-1994. Referencia : LR031665. Código interno para información: 119448. Vendemos vehículos preseleccionados de nuestra flota asociada. Nós podemos verificar isso. Wir können es überprüfen. AMORTIGUADOR TRASERO DERECHO LAND ROVER DEFENDER 90 SVX Familiar, Año: 2009, RPD401010, E5304501. Referencia : LR044347. Nós podemos verificar isso. Wir können es überprüfen. Código interno: 923240. Amortiguador trasero izquierdo LAND ROVER RANGE ROVER SPORT V8 TD hse, Año: 2009 22238307. Referencia : LR016420. Wir können es überprüfen. Nous pouvons le vérifier.